India 8-297 (Virat Kohli 103, MS Dhoni 99, James Anderson 4-68) trail England 330 (Kevin Pietersen 73, Joe Root 73, Matt Prior 57, Piyush Chawla 4-69) by 33 runs. 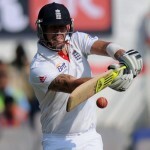 England smashed a reasonable score of 330 runs in their first innings and India responded with 8-297 in 130.1 overs. The third day’s play finished on Saturday, December 15, 2012, at Vidarbha Cricket Association Stadium, Jamtha, Ngapur. Earlier, India started the day in a dismal situation at 4-87 in 41 overs while Virat Kohli and MS Dhoni were unbeaten for 11 and 8 runs. Dhoni hit the first four of the day in the 44th over and crept to the first hundred of the innings in the 52nd over with a boundary from Kohli. The English bowlers did not give much chances of scoring to the batsmen and were delivering quite a few maiden overs in between the play. Both batsmen did not take any chance and kept on concentrating as the score board kept on ticking slowly. The boundaries were hard to find but the batting duo did not show signs of panic and reached 146 after 73 overs without losing any wicket at the lunch interval. Virat Kohli touched his 6th Test fifty on the last ball of the 77th over with a four as the home side crossed the 150 runs mark. England took the second new ball with the intention of making a breakthrough but Dhoni welcomed the first ball of the 82nd over off James Anderson for a four. MS Dhoni kept on cruising from his end and achieved his 28th Test half century on the fourth delivery of the 85th over by directing the ball out of the deep point boundary. The run rate was picked up by the pair with the regular boundaries as the score board started moving fast. Dhoni dispatched the first six of the innings to Graeme Swann on the third ball of the 93rd over and India crossed 200 runs as well. The captain of England, Alastair Cook, made many changes in the bowling but remained unsuccessful in getting a wicket. Virat Kohli thrashed his third Test hundred on the third ball of the 115th over with a four that was cheered up by a huge crowd present in the stadium and the players and officials in the pavilion. He scored his previous ton by scoring 103 runs against New Zealand at Bangalore on August 31, 2012, and managed 51, 19, 14, 19, 7, 6 and 20 runs in the following innings. England got the first success of the day when Virat Kohli was declared leg before wicket off Graeme Swann on 103 from 295 deliveries with 11 fours. 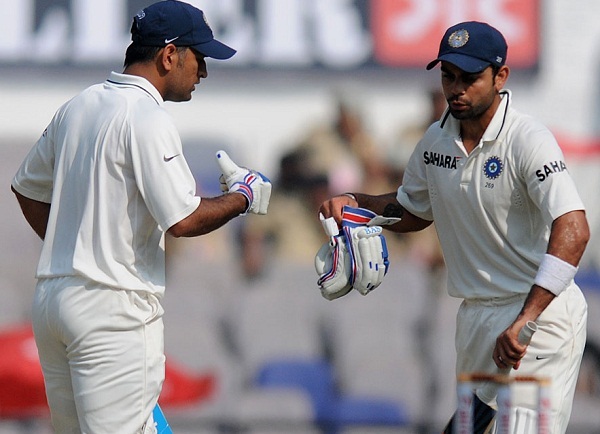 The fifth wicket partnership contributed a much required 198 runs and brought stability to the Indian innings. MS Dhoni was batting at 91 as Ravindra Jadeja joined with him in the park and hit 2 fours in the following overs. James Anderson removed Jadeja for 12 runs as Ravichandran Ashwin replaced him at the crease. MS Dhoni got 90 runs in 216 balls and added another nine runs in 29 deliveries and kept hanging in the field in search of his sixth Test ton. He was unluckily run out for 99 on a sharp throw from Alastair Cook who threw the ball directly on to the stumps from mid off. Dhoni scored 99 runs off 246 balls with 1 six and 8 fours as India lost the eighth wicket of Piyush Chawla who was clean bowled by Swann for one run. India managed 297 runs in 130.1 overs for the loss of 8 wickets as the play was called off for the day. England did not give up and came back in the game by taking all four wickets in the last session of the fourth day. 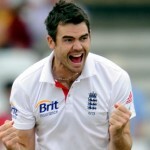 James Anderson was the chief wicket taker with four wickets whereas Graeme Swann chipped in with three wickets. India is still 33 runs behind the first innings total of England and the team which plays better on the fourth day can take an advantage in the match.